Violent Video Games = cool under pressure in meeting. It appears that playing violent video games reduces hostility. So that's how I can handle contentious meetings...I can thank being #2 in the world (quarterly) playing Unreal Tournament 2. Good to know! Team-based games = lack of complacency in ministry. It appears that youngsters who play World of Warcraft have better team-building and goal-oriented skills than others. While I was too far into ministry to have a WoW account or participate in any MMORPGs, there's plenty of team-based games under my belt. How about you? If you are a gamer, what did you learn that helps in your ministry or vocation? Peter, his brother Andrew, James the older, John, Thomas, Matthew, Philip, Bartholomew, James the younger, Simon, Judas Thaddeus, Judas Iscariot, Matthias and Paul. Notice anything? Yep...NO WOMEN. No Mary Magdalene, no Mary & Martha, no early house church patronesses. Heck, Paul made the list and he wasn't even around in the "Jesus of Nazareth" days. But no Mary who was the first person in Matthew, Mark, and Luke's gospel to see/know of Jesus' Resurrection. The book went on sale on July 22, the Feast of Mary Magdalene. I never was an Anne Rice fan and only marginally enjoyed Christ the Lord series of books she wrote after converting. But she showed up in my feed reader this morning as she has disavowed Christianity but will continue to follow Christ. I sympathize with the perspective that Christianity is quarrelsome and full of disputes. But what group isn't? It is human nature to conflict, dispute, resolve, and move on to the next conflict. Even Christ himself was constantly in conflict with those around him, so if Rice is looking for a consistent state of nirvana, it ain't Christ. Read on for more updates and the responsibility of seeking redemption for flawed human movements. As I said below, I quit being a Christian. I'm out. In the name of Christ, I refuse to be anti-gay. I refuse to be anti-feminist. I refuse to be anti-artificial birth control. I refuse to be anti-Democrat. I refuse to be anti-secular humanism. I refuse to be anti-science. I refuse to be anti-life. In the name of Christ, I quit Christianity and being Christian. Amen. Well, honestly, if that's Christianity then I'm not one either, on every single point. Christianity is not monolithic, and every social issue or theological issue has people across the spectrum on it. It did not begin that way, and it has only gotten more spread out over time. There will always be people to disagree with in your club, but you gotta keep your membership card to get the benefits. Finally, she writes an hour-ish ago before this post. Gandhi famously said: “I like your Christ, I do not like your Christians. Your Christians are so unlike your Christ.” When does a word (Christian)become unusable? When does it become so burdened with history and horror that it cannot be evoked without destructive controversy? Her last point hit me in the gut, not from realization of something but from my long-standing wrestlings with this. The way I see it is that no human movement is without its flaws, even the ones we believe to be divinely driven and sustained. Even the bible is not without its flaws and errors that do not translate 2000 years in the future. The constitution, heralded as the pinnacle of human freedom and collective sustainability, only considered white men to be people. Maybe that's why Jesus drew people close to him as a group rather than directing them one-on-one. In our flaws, we find out how to be human together. As a group together, we help those flaws become smoothed out until we are people without wax. Christianity without Christ is folly, but willingly following Christ in solitary does not heed his example either. It comes down to if you think Christianity is redeemable. If you want it to be redeemed, then stay inside and work for change. If your denomination's doctrine and policies rub you the wrong way, stay inside and work for change. If you love something, truly love it, then you have to see it as redeemable, and then it is your responsibility to work to redeem it...even if all you do is plant the seeds that someone in the next generation actually gets to bear fruit. What do you think? Thoughts? Post them in the comments and welcome to the conversation! At summer camp, our district superintendent played this video about a cinematographer whose questions about God and the human condition play out in a powerful way. It's titled "A Thousand Questions" and asks "who will clean up the mess humanity finds itself in?" Yes, it's 10 minutes long. Yes, it's worth your time. 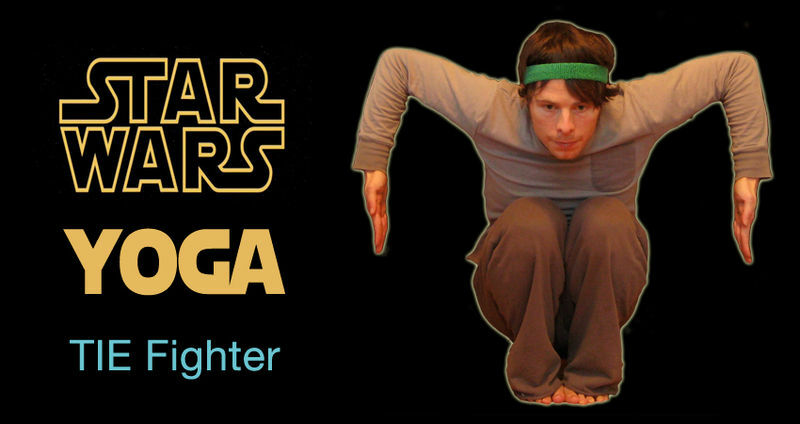 Since my spouse is a yoga teacher, that gives me two reasons to link to it. Enjoy! A few days back, Clay Johnson suggested that our government could use more computer developers in Congress to better streamline, communicate, and provide clarity to the legislative process (h/t Andrew Sullivan) Many voices replied to his comments, with either stereotypical views of computer programmers that live in their parents' basements (1) (2), or helpful commentary on how to build such a movement (3). However, Johnson has many points that struck me as relevant to this blog...so consider this a call for more developers to enter the ministry! First, Johnson argues that increasingly bureaucratic institutions are more technological and thus need technology-savvy people to administrate them. Government’s problems are becoming increasingly technical… check out the first piece of legislation this Congress passed: The American Recovery and Reinvestment Act of 2009 isn’t just a 1000+ page bill that’s now a law, it’s also a technical specification for recovery.gov written by people who don’t know how to write specifications. It strikes me that as our existence is increasingly technological, pastors need to speak to the role of technology in our lives and I doubt many of them have strong understandings of the technology itself. Hysteria over privacy and facebook are great sermon topics but are easily fixed by simply understanding the system. Parental concerns over their children's increasing transparency online are pastoral concerns too. By encouraging more developers to enter the ministry, we will have more pastors that can speak to the role of technology in our lives. [G]reat developers are systems fixers and systems hackers. There is no system more ripe for elegant process hacks than the United States House of Representatives. Put a developer in Congress, and they’ll start exposing data on their own. They’ll build systems to make it so they can hear from their constituents better. Now, this is a sticky area for hacker pastors: communications in churches can't be scripted or coded. There can be procedures in place but human participants will not keep to them. However, the entire system of communication could be looked at from a human systems perspective, or the application of communication theory to human systems. The image of smoky back rooms where church decisions are made (which are on the down anyway) can be more nuanced with a clearer communication center. Finally, Developers are great digital communicators. They’re great at using the medium to connect directly with people in ways that others cannot. They can build their own tools to connect with people, too. With a Developer who understands the guts of the web in a leadership spot inside Congress, Congress can start communicating more effectively online. And as this developer becomes more successful, the rest of Congress may very well follow suit. 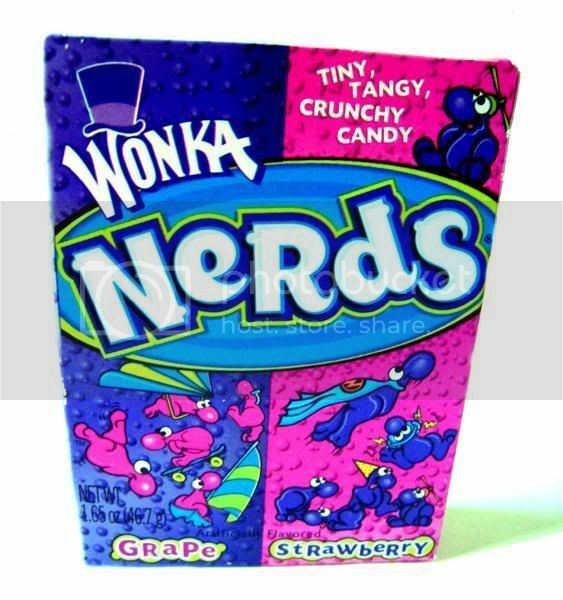 Yes, an unfortunate percentage of nerds are (a) socially awkward and (b) unable to communicate their feelings well. However, for those who are able to overcome such things, developers take what their constituency wants and re-presents it in creative ways. What do you think? How would computer developers fare in the parish? For those of you who are hacker pastors (and probably online and will respond...yay! ), what shared skills are important in both professions? "On September 11th, 2010 we will burn the Koran on the property of Dove World Outreach Center in Gainesville, FL in remembrance of the fallen victims of 9/11 and to stand against the evil of Islam. Islam is of the devil!" Islam is a weapon of Arab imperialism and Islamic colonialism. Wherever Islam has or gains political power, Christians, Jews and all non-Moslems receive persecution, discrimination, are forced to convert. There are massacres and churches, synagogues, temples and other places of worship are destroyed. Anyone ever heard of the Crusades? Anyone out there? Am I alone on the Internets? Thanks for your concern. We are unconvinced that the 'nice' church is winning against the Kingdom of darkness. God and his people were not always sweet and loving to people to people and practices that were evil. Amazing. Burning books, claiming an entire faith as evil, and disowning the 'nice' churches that care for the sick, love sinners, and offer gracious presence...yep, sounds like WWJD to me! I think part of ministry is being a foil to the your ministry team. In drama and literature, a foil is a character who is contrasted with the main character to bring to the surface a particular quality. 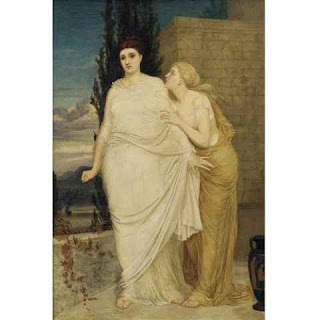 Think Watson to Sherlock or Ismene to Antigone (pictured). Or more contemporary, Locke to Jack in Lost or Wilson to House in House. Because the first character is such a contrast to the second, their qualities are more pronounced. A few months ago, I got onto the youth during church for talking and texting during church service. They didn't change their behavior. The next Sunday their Sunday School teacher mentioned it during their lesson. They stopped (well, they stopped doing it obviously, which is well enough). Yesterday the senior high youth had their Sunday School teacher back after a 3 week hiatus, during which period I taught the class, much to their groans. They came out saying that they had the best lesson, updated their facebook statuses to say so, and actually quoted their lesson back to me. Now, it may be that I'm a terrible disciplinarian and youth minister. Or it may be that leadership isn't about being a perfect leader or all things to all people. Maybe it is about realizing who can teach your charges what, and doing all you can to empower them, even if you lose some street cred of your own in the process. After all, the laity will be in the local church longer than the ordained clergy. Too often ministry leaders get their egos swelled by their own abilities. So maybe it's OK to be a foil, to be the opposite and play the unpopular roles, so that your own ministry team's qualities are made more evident to the youth and to the team itself. What unpopular role is needed in your group that might expose powerful gifts to the charges and the charged alike? 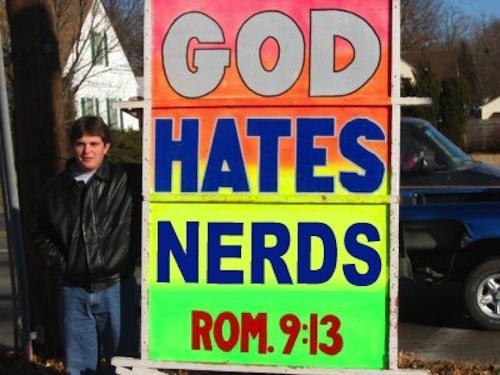 Apparently our friends at Westboro "Church" have ran out of social groups to protest and have moved on to...nerds. They are planning on protesting ComicCon (h/t Bilerico) this year. Seriously. Are you kidding?! If these people would spend even some of the energy that they spend on these comic books, reading the Bible, well no high hopes here. They have turned comic book characters into idols, and worship them they do! Isaiah 2:8 Their land also is full of idols; they worship the work of their own hands, that which their own fingers have made: 9 And the mean man boweth down, and the great man humbleth himself: therefore forgive them not. It is time to put away the silly vanities and turn to God like you mean it. The destruction of this nation is imminent - so start calling on Batman and Superman now, see if they can pull you from the mess that you have created with all your silly idolatry. If we were even taking this seriously, being an enthusiast (nerd) of a topic does not necessarily equal misplaced devotion. 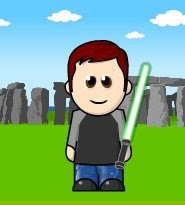 There are multiple motivators for becoming one, and multiple sustaining forces once nerd-dom has been established. More often than not nerdiness is an escape from reality or a relaxation from stress...and most likely, the stress itself is the idol. But while we're talking about misplaced devotion, I'm calling pot and kettle here. If Westboro spent as much energy on reading the bible as they do making God look ugly, they'd be rockin' scholars instead of the surface-level enforcers that they are. Similar to how people will accuse politicians of being “soft on crime,” sometimes Christians accuse each other of being “soft on sin.” The idea is that there needs to be justice and consequences. People have to pay the cost of their actions and learn from their mistakes. When you’re “soft on sin,” you’re giving people too many second chances, you’re not holding people accountable the right way, you’re being too gracious. So people accused me of giving evil a free pass. I’m not soft on sin. I’m not shy about repentance or consequences or hurt or suffering or pain. But when it comes to loving people, our Lord has set an incredibly high bar. So love the people no one else loves. Show grace without end. Give comfort even when it makes no sense. And as far as the DVD copy of my trip to hell goes? I’m not concerned about emails like that. “You’re too loving” and “you show too much grace” are insults I will forever accept. (3) There's got to be a middle way, hasn't there? A way where we can judge with love, a way we can exhibit tough love, a way we can hold one another accountable with just enough grace and judgment to hold them in a constant state of assurance and uneasiness? A way to not go "as far as" Jesus did, but not act like we are judge and jury, right? Surely we are called to the middle and not the extremes, right? There's got to be a middle way between grace and judgment. My senior minister noted this past Sunday that Jesus is often sending people to do stuff. Sending disciples to get a donkey for the entrance to Jerusalem. Sending disciples to prepare the upper room Sending the Lawyer out to "do likewise." 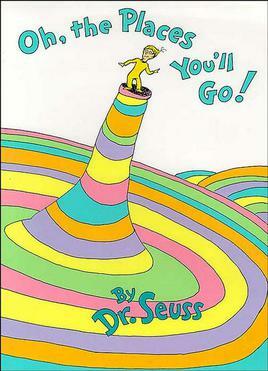 Telling people to "Go" and do something. Often, Jesus was standing still while his disciples did the work of ministry around him. Perhaps we are called to play a "Go" role in in the kingdom, going to the slums, going to do the work, going to be the hands and feet, going to the depths of grief with another, going to the floor in advocacy, going to the town hall in protest, going to the mattresses, going to where Christ does not seem to be found, wanted, or acknowledged. Perhaps in a world of taking all that you can get, we are called to go to the extremities of pain, grief, doctrinal rigidity, and apathy and bring them back to the Christ who calls for them.